For Shiva Haghighi and Ryan Zachar, taking on leadership roles is nothing new. As the (then) acting president and vice president, respectively, of the Civil Engineering Student Advisory Council (CESAC), they've already committed to serving the university and their fellow students. For these two, normal responsibilities include planning annual career fairs, sponsoring student socials, putting together and promoting shop talks, spearheading canned food drives, and organizing a "date auction" to benefit the American Cancer Society. This past summer, they took their roles a step further—5,000 miles further (farther actually), to be exact. 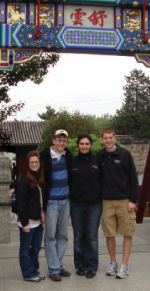 Each year, the School of Mechanical Engineering embarks on a multi-week trip to China where students immerse themselves in the culture and engineering challenges and opportunities present due to China's rapid industrialization. However, no such trip existed for civil engineering students, which to Haghighi and Zachar didn't make much sense. After all, there were at least as many— if not more—civil engineering applications in the burgeoning cities of China. And so Haghighi and Zachar did what only seemed natural: they, along with fellow civil engineering seniors Katie Coressel and Tom Paladino, decided to accompany the mechanical engineering trip this past summer to perform a feasibility study proposed by the School of Civil Engineering. The goal was to determine if civil engineering could support a China trip in the future. Gaining approval, they attended weekly spring-semester meetings to prepare, and by May they were off to Beijing. In all, they covered four cities in two weeks. From Beijing, it was off to Harbin and Ningbo before the visit ended in Shanghai. Spending between three and four days in each city and examining each locale through a civil engineering lens, Haghighi and Zachar came away with some very strong impressions. "Everything in China is on a larger scale," Zachar relates. "Every corner has a new construction project going on—the horizon is clogged with cranes." Haghighi agrees. "In Beijing, I saw more infrastructural work going on than I'd ever seen before," she says. "Shanghai had more interesting architecture, but it seemed that no matter what city you were in, wherever you turned there was a factory, an industrial facility, or a new high rise springing up. It was unbelievable." Returning to West Lafayette, Haghghi and Zachar passed along their recommendations to the school committee. Some of their suggestions were logistical: cut out one city to focus more time on studying structures and less time on traveling; be sure to see certain neighborhoods and buildings in each city; extend the trip to at least three weeks, maybe four. And then there was the more qualitative advice. "Everything felt very structured and planned for every hour of the day," Zachar admitted. "We never had much of a chance to explore on our own." Haghighi added that their first night out on their own with a group of local university students was one of their favorite experiences on the trip. "It's definitely a world apart," says Haghighi, "but talking to the engineering students, you learn that a lot about their lives and our lives here are the same. The same messy dorm rooms, the same thermodynamics lessons on the chalkboards. They're just normal engineering students doing a lot of the same things as us." Normal engineering students. Though they may not say so themselves, that just might be one thing Shiva Haghighi and Ryan Zachar are not.